Truman State University has announced receipt of a $2.87 million cash gift, the second-largest ever in the University’s 141-year history. The gift is from the family of Squire Paul and Meeda (Daniel) Holman, a family with a deep history with Truman. The gift is designated in three major areas: an endowment for need-based stipends for students to participate in study-abroad programs; an endowment for a distinguished speaker series to bring national and international figures to Truman’s campus; and an endowment for need-based stipends for students to attend Truman’s graduate programs. Truman State University offers study-abroad opportunities in more than 50 countries around the world, and each year more than 500 Truman students participate in study-abroad programs. This endowment will allow a greater number of students to broaden the impact of their college career by participating in a study-abroad program. The speaker series funded by the endowment will showcase national and international figures and provide interaction opportunities with Truman students, faculty and staff, and the northeast Missouri community. Several opportunities are available at Truman for students searching for professional training or advanced study in a liberal arts field, and Truman’s graduate programs have a long history of receiving national recognition. Support for graduate students in the form of stipends will help attract bright scholars who wish to pursue a graduate experience and encourage them to attend Truman’s distinguished graduate programs. The late Squire Paul and Meeda (Daniel) Holman each spent their childhood and young-adult years in Green Castle, Mo. Paul served in the U.S. Armed Forces during World War I, and Meeda attended Missouri Wesleyan College in Cameron, Mo. They were married in 1923 and moved to Kirksville, Mo., in 1937. Paul became a member of the staff at Truman State University, then known as Northeast Missouri State Teachers College, serving as the building custodian for Science Hall for 17 years. Both Paul and Meeda took an active role in the lives of the young scholars attending the university, and over the years, many students lived in their home, which was located across the street from the Blanton, Nason, and Brewer residence halls. The generous gift was made to Truman State University’s “Bright Minds Bright Futures” campaign and will touch a number of young lives for generations to come. The “Bright Minds Bright Futures” campaign is a major component of Truman’s strategic plan and vision to become the nation’s premier public liberal arts and sciences university. The $30 million campaign will provide support for student scholarships, student enrichment initiatives, faculty development, and enhancements to the athletic program. 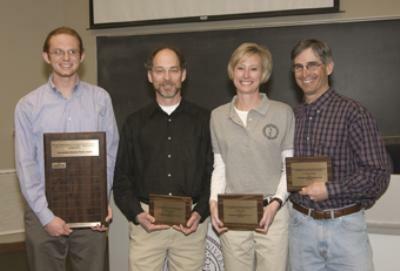 Doug Eudy (left), student representative on the Student Research Committee, stands with the three recipients of the Outstanding Research Mentor Award (second from left to right): Brent Buckner, professor of biology; Janet Gooch, associate professor and department chair of communication disorders; and Thomas Zoumaras, professor of history. Truman State University President Barbara Dixon (left), and Randall Smith (right), professor of music, present Eric Schweizer (middle) with a certificate for being named a Presser Scholar. 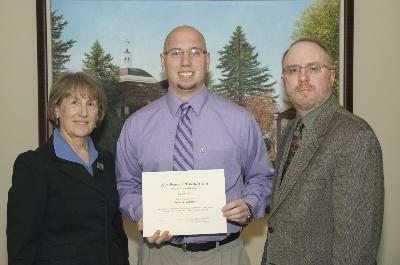 Eric Schweizer, from Oakville, Mo., has been named a Presser Scholar for the 2008-2009 academic year. He will be senior in the fall of 2008, and is majoring in music performance (saxophone) at Truman State University. The Presser Scholarship is given to an outstanding music major at the end of his or her junior year. 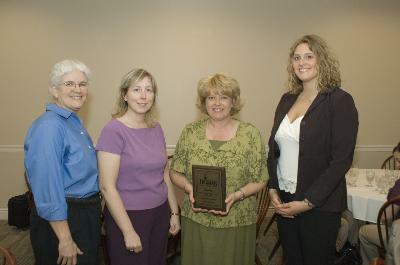 The foundation’s grant was awarded to Schweizer this spring. Theodore Presser is remembered not only as the publisher of Etude, the music magazine, and the founder of the great music publishing firm bearing his name, but also as a philanthropist who specialized in music education. Schweizer is the son of Gregory and Diane Schweizer of Oakville. He is a graduate of De Smet Jesuit High in Creve Coeur, Mo. While he attended high school, he participated in many solo and ensemble competitions, attended the Illinois Summer Youth Music and Webster Jazz Camps, toured Europe with the Sound of America in 2004, and performed as a member of the American Federation of Musicians, Local 2-197. At Truman, he performs as a saxophonist with the Wind Symphony I, Jazz Ensemble, Jazz Combo, and Saxophone Quartet. In January he performed at the Missouri Music Educators’ Convention as a member of the 2008 Missouri All-Collegiate Band. In April he performed Paul Harvey’s “Concertino for Baritone Saxophone and Orchestra” with the Truman Symphonic Orchestra as a winner of the Gold Medal Concerto Competition. Last year he performed in a master class with David Nabb, assistant professor of music from the University of Nebraska at Kearney. In addition to performing, he is a member of Phi Mu Alpha, a professional fraternity for students in music, and was a freshman theory mentor. In April he presented an interdisciplinary paper titled “Dmitri Shostakovich: Composer, Hero, and Gentile Jew” at the 2008 Truman State University Student Research Conference. Schweizer studies saxophone with Randall Smith, professor of music; clarinet with Jesse Krebs, assistant professor of music; and jazz improvisation with Tim AuBuchon, assistant professor of music. (Left to right) Sarah Delaware, Truman nursing faculty; Acute Care Preceptors of Year Dee Cox and Jo Dixson (NRMC); and Jenny Dine, Truman senior nursing student; gather following the awards luncheon May 1. Truman State University’s Nursing Program recently selected Jo Dixson, R.N., C.W.O.N., and Dee Cox, R.N., C.D.E., as its Acute Care Preceptors of the Year. Dixson and Cox were honored at an awards luncheon May 1 at Truman. Dixson and Cox are employed at Northeast Regional Medical Center in the Wound Clinic. Dixson is a Certified Wound and Ostomy Care Nurse and Cox is a Certified Diabetic Educator. Both have served as preceptors for Truman nursing students for several years. 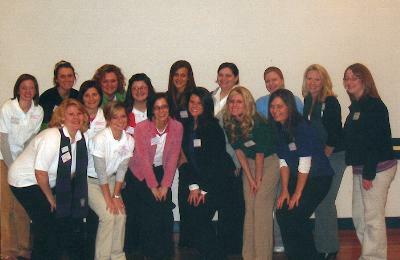 The Nursing Program at Truman selects highly qualified registered nurses to serve as role models, mentors and supervisors for senior nursing students in selected clinical areas of interest. These R.N. preceptors assist the faculty and students in meeting course objectives in the selected clinical areas. Each year faculty and senior students select and honor acute care and community preceptors of the year. Contact Sarah Delaware and Stephanie Powelson from Truman’s Department of Nursing at 785.4557 for more information. 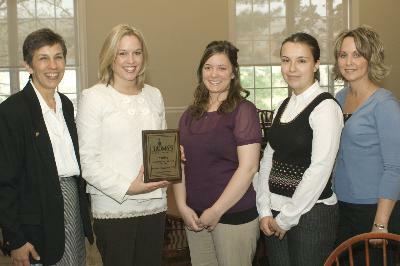 (Left to right) Stephanie Powelson, Truman Department of Nursing chair; Preceptor of the Year Vanessa Lincoln, Linn County Health Department; Story Sollars and Iryna Sydorenko, Truman senior nursing students; and Pam Melvin, Truman nursing instructor; gather after an awards luncheon May 1. (Left to right) Sarah Delaware and Corrie Willis, Truman nursing faculty; Preceptor of the Year Bridget Morton, long term care psychiatric coordinator for Dr. Lovy; and Kathryn Adler, Truman senior nursing student; gather following the awards luncheon May 1. Truman State University’s Nursing Program recently selected Bridget Morton, B.S.E., R.N.-C, and Vanessa Lincoln, B.S.N., R.N., as its Community Preceptors of the Year. Morton and Lincoln were honored at an awards luncheon May 1 at Truman. Morton is employed as a long term care psychiatric coordinator for Dr. Lovy and as the chair coordinator for Carelink Better Self-Management of Diabetes Program. Lincoln is a home health nurse with the Linn County Health Department. Both have served as preceptors for Truman nursing students for several years. The Nursing Program at Truman selects highly qualified registered nurses to serve as role models, mentors, and supervisors for senior nursing students in selected clinical areas of interest. These R.N. preceptors assist the faculty and students in meeting course objectives in the selected clinical areas. 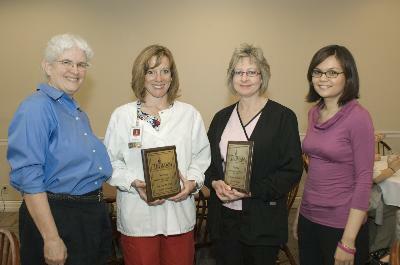 Each year faculty and senior students select and honor acute care and community preceptors of the year. Communication disorders graduate students visited the Capitol in Jefferson City, Mo., to promote the Missouri Speech Language Hearing Association Legislative Day. Judith Misale (left), President Kirksville Chapter of Sigma Xi, presents and Louise Smith (right) with the Sigma Xi Teacher of the Year award. 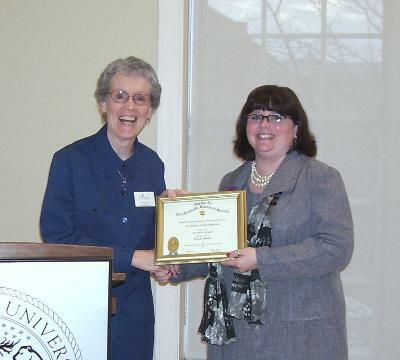 Louise Smith was named 2008 Teacher of the Year by Sigma Xi, the Scientific Research Society, at the annual banquet of the Kirksville Chapter April 24 at Truman State University. This award is given to elementary and high school science teachers in northern Missouri who inspire a love of learning in their students and encourage and nurture students’ interest in science. Smith teaches fourth and fifth grade science at Adair County R-II in Brashear. She is excited about science and works hard to make science real for her students. 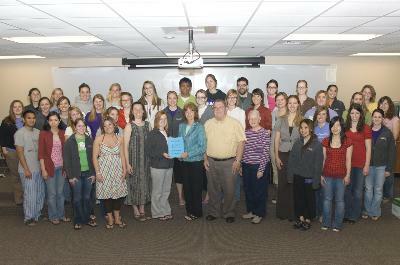 In addition to being the 2008 Sigma Xi Teacher of the Year, Smith recently received a Toyota Tapestry Science and Literacy grant that will allow her students a comprehensive comparison of Missouri and Antarctic ecosystems that will spawn not only investigation but also science education and outreach opportunities for the entire community. At the same ceremony, Matthew Beaky, associate professor of physics at Truman, was named the Chapter’s 2008 Sigma Xi Researcher of the Year. Beaky is an accomplished and prolific scholar who is remarkable in his dedication to mentoring students at Truman through all stages of the research process. 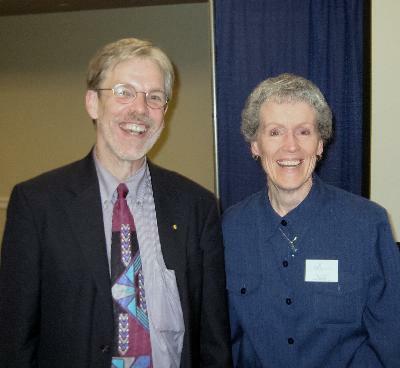 For all these reasons, Kirksville Sigma Xi salutes Beaky and Smith and their good work in facilitating the development of our scientists of tomorrow. Students present a recipe book to board members of the Kirksville Food Depot (pictured front row, left to right) Erin Herbst, Amelia Ousley, Teak Nelson (instructor), Megan Burns, Debi Boughton (Food Depot board member), Don Kangas (Food Depot board president), Jeanne Kangas, Thiky Vorachek and Duyen Van; (second row, left to right) Bryan DeGuzman, Suoung Nguyen, Ashley Swain, Amanda Wilson, Kelsey Aurand de Razo (Americorps Vista), Jess Evelsizer, Rachel Tharp and Lauren Wilson; (third row, left to right) Veronica Gunter, Emily Schroeder, Emily Reinart, Lauren Schlesselman, Haley Hamlin, Karen Wohlberg, Jamie Menown, Lizzie Brown, Devon Mills, Kristin Kimrey, Erin Bonser, Jennifer Jackson and Sarah Thompson; (fourth row, left to right) Britney Snodgrass, Barbara Kuehny, Lindsay Walsh, Katie Hinrichs, Megan Laughter, Phil Hadwiger, Kristen Nissen, Ben Hainline, Theresa Weinhold, Laura Fienup, Jess Jacobi and Kelsey Mason. Students tried out all of the recipes they created or modified to ensure that the recipes are appetizing as well as simple and nutritious. After the quality-assurance phase passed, the students compiled the recipes and put them into a book format. Truman State University nursing students in the Human Nutrition class presented a recipe book to the Kirksville Food Depot recently. The students put their classroom knowledge to work this spring semester by working with the Kirksville Food Depot to create a recipe book to distribute to their clients. The Food Depot is a consortium of churches that donate food on a rotating basis to the pantry and then distribute the food to families who are in immediate need of groceries. Due to its structure, the Food Depot is able to provide nearly the same ingredients and food items to each family every time. The students were given the list of these various ingredients and food items and were asked to create or modify a week’s worth of recipes using the items on the list while demonstrating the nutritional value of the recipes. The project is an effort to provide nutritious, easy-to-make recipes to the lower-income families and ideally promote healthier eating habits. Taiwan at Truman is a program for high school age Taiwan students to come to Truman State University campus for five weeks to improve their English and to learn about American culture. The Taiwan at Truman Program is looking for families to host a home stay weekend for the Taiwanese students in the program from June 20-22. Twenty-eight high school age girls will be participating in the program. Families can host one or two girls at their home and show them American culture while learning about Taiwanese culture. The whole family can enjoy this cultural experience. For more information about the program or to volunteer contact Liz Enberg, director of the Taiwan at Truman Program, at eae626@truman.edu or 314.249.3356. Truman needs volunteers to work July 14 at the NEMO Fair. Volunteers will receive a free one day pass to the fair. Please call the Public Relations Office at 785.4016 to sign up or stop by McClain Hall 101 if you are interested in volunteering. Registration form can be found online at http://gobulldogs.truman.edu. Jason Skoch, Truman’s head volleyball coach, leads this three-day camp at the YMCA. The camp will be an introduction to volleyball’s core skills: serving, passing, setting, hitting and digging. Camp is open to all girls enrolled in grades 6-8. Cost is $40 for YMCA members and $50 for nonmembers. Camp will run from 1:30-4 p.m. each day. For more information, contact contact Jeremy Neuman at 665.1922 or jneuman@cableone.net. Log on to http://gobulldogs.truman.edu for more information about Truman athletic camp opportunities. The new library exhibit highlights the history of the summer Olympic movement from 1896-2008 with a special emphasis on the Summer 2008 Olympics to take place Aug. 8-24 in Beijing, China. Check out the exhibit on Truman’s own Olympic gold medalist from the 1984 Olympics, Ray Armstead, as well as all the interesting facts about different Olympics and the country of China. Donations are now being accepted for the Pickler Memorial Library’s Third Annual Book Sale. The sale will take place Sept. 23-25. All books, CDs DVDs, tapes, videos, records, sheet music, puzzles, games, art prints and other items are welcome. Donations may be dropped off at Pickler Memorial Library. Proceeds from the book sale will be used for library materials and programs. For more information, call 785.4038 or log on to http://library.truman.edu/booksale.htm. The Saturday drop off for recycling will be stopped during the summer. No Saturday drop off will take place from May 17-Aug. 16. Betty L. McLane-Iles, professor of French, participated in the recent annual conference of the French Colonial Historical Society in Québec City, Québec, from May 14-18. McLane-Iles presented a paper on “The Defense of Cultural Integration and Social Justice in Biographical Portrayals of Three Major Progressive Francophone Women Political Leaders” in the panel “Great Men and Women in French Colonial History.” The three political leaders featured were Louise Beaudoin, former Minister of Francophonia, Culture and Communication, and International Relations for PQ Québec; Christiane Taubira, of the French National Assembly representing French Guyana since 1993; and Elisabeth Guigou of the French National Assembly, former Minister of European Affairs, of Justice, and of Employment and Social Affairs. Eric Patterson, associate professor of chemistry, has been granted a Cottrell College Science Award of $37,720 from Research Corporation. This award will fund two undergraduate research students per summer for two years, and the funded research will explore various ways that chemical warfare agents may be chemically degraded to yield harmless products. Helen K. Pham, a pre-accounting and pre-business administration double major from St. Louis, has been awarded a Phi Kappa Phi Study Abroad Grant for 2008. Pham will participate in a study abroad program in China. Study Abroad Grants are designed to recognize and assist undergraduates as they seek knowledge and experience in their academic fields by studying abroad. Fifty grants valued at $1,000 each are awarded annually. The Student Recreation Center Fitness/Wellness is offering free fitness classes for students, faculty and staff in town for the summer. Classes offered include step, yoga, body sculpting, ballet and more. For more information visit http://recreation.truman.edu/instructional_programs.asp. Are you taking advantage of Staff Exercise Time? For more information visit http://recreation.truman.edu/set.asp. The Downtown Revitalization and Economic Assistance for Missouri (DREAM) Initiative will be having a public meeting at 6:30 p.m. June 2 in the Adair County Annex Building, located at 300 N. Franklin St. in Kirksville. The DREAM kick-off meeting will be presented by the Missouri Development Finance Board (MDFB), Missouri Department of Economic Development (MDED), Missouri Housing Development Committee (MHDC), and PGAV Urban Consulting. The DREAM Initiative allows access to technical and financial assistance necessary to accomplish downtown revitalization plans. For more information, log on to http://www.dream.mo.gov. A public meeting will take place to discuss the Highway 63 alternate route from 4-7 p.m. June 12 at the Missouri Department of Conservation Building, located at 3500 S. Baltimore St. in Kirksville. The Board of Governors will meet at 1 p.m. June 13 in the Student Union Building Conference Room. The Board of Governors retreat will take place at 9 a.m. June 14 in the West Campus Suites Multipurpose Room. The next issue of the Truman Today will be published June 17. Truman Today is published biweekly during the summer. Submissions for the next issue are due by June 11 to truman.kbest@gmail.com. Sodexo invites members of the Truman community to attend barbecues on the Mall this summer. The dates are June 13, June 26, July 11 and July 25. The Center for Student Involvement (CSI) is now accepting registration for the 2008 Activities Fair, to take place from noon-4 p.m. Sept. 4 on the Quadrangle. All campus departments and student organizations in good standing with the CSI are eligible to register. Registration forms are available in the Center for Student Involvement or at http://studentinvolvement.truman.edu. The first 100 organizations to sign up will be entered into a drawing for a prize.